After two decades working inside a human rights organization, I was lucky to have the opportunity to take this past year to reflect, both on my own work and on that of the human rights community as a whole. In the intense pace of human rights advocacy in Israel-Palestine, organizations have little time to step back from their daily operations and reflect on their accomplishments. The reflection that does take place is invariably self-critical. We excel at identifying problems and working to fix them. So when evaluating our own work, we also tend to focus on what is wrong. Even when we make gains, we are quick to point out why it’s not good enough. I chose to do exactly the opposite: to identify human rights achievements and see what we can learn from them. I interviewed a dozen leading human rights activists, Palestinians and Israelis, asking them to name our most important achievements. It was relatively straightforward to see our impact when it comes to individual assistance. Over the past twenty years, organizations have aided hundreds of thousands of Palestinians to access their rights: releasing people who were arbitrarily detained, improving detention conditions, enabling access to farmlands, facilitating access to medical care, enabling people to travel, and obtaining compensation for victims of violence. On the level of public discourse, most experts agreed that the information and analysis generated by human rights organizations have shaped the public conversation, both in Israel and internationally. Journalists, diplomats and policymakers looking for information on our issues turn first to the human rights community, and this informs their work. But I was most interested in analysing our role in promoting policy changes, and this was more difficult to identify. It is not even immediately clear whether a new development is a net gain or a net loss for human rights, much less what our role was in bringing the change about. Take the cases where the human rights community obtained a Court judgment requiring removal of an illegal Israeli settler outpost constructed on Palestinian-owned land. Not only do these judgments recognize the principle of Palestinian land rights, in some of these cases, the military actually removed the outpost, ostensibly an important achievement in the battle against Israeli settlements. Yet invariably the settler movement was compensated with more extensive settlement construction elsewhere. Can this be considered a gain for human rights? And what about the efforts to obtain residency status for tens of thousands of women married to Palestinians who had been living in the West Bank “illegally”, facing the constant threat of deportation. These women received residency status, but as a “humanitarian gesture” to Palestinian president Mahmoud Abbas; Israel never recognized that Palestinians have a right to live with their family in the West Bank. Can this be considered an achievement for us? Human rights activists I interviewed gave different answers to these questions. Treading carefully through this minefield, I compiled a list of fourteen policy changes that resulted in greater enjoyment of human rights. Interviews with human rights leaders, as well as with government and military officials involved and consultations with primary source material, enabled me to construct a theory to explain how each policy change came about and the role the human rights community played. My approach was similar to the “strategic plausibility” proposed by Jeremy Smith and Jim Coe. Destruction crews carry out a court-ordered demolition of apartment buildings on the outskirts of an Israeli settlement near Ramallah, West Bank. 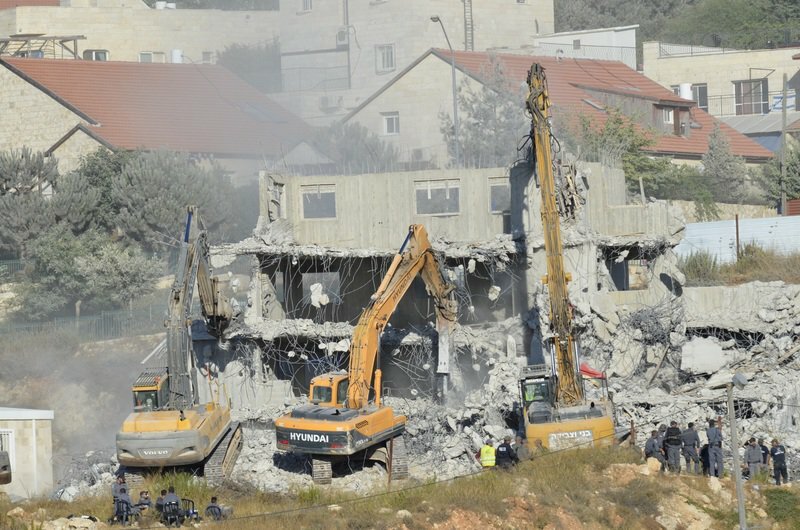 In the case of punitive home demolitions, for example, human rights organizations filed some 70 petitions to the Israeli High Court against demolitions. Every single petition was unsuccessful yet criticism about the morality and legality of the demolitions grew, both domestically and internationally. A report from a human rights organization spurred the Knesset Law Committee to hold hearings in which the Military Advocate General had to defend the demolitions. In 2004, the Israeli military established a committee to re-examine the policy and this committee recommended halting punitive demolitions. This decision lead to a ten-year moratorium on punitive demolitions (punitive demolitions were renewed in 2014, albeit on a smaller scale). While from 2004-2014 Israel continued to demolish Palestinian homes using other legal justifications, the moratorium undoubtedly saved hundreds of families from collective punishment and homelessness. Achievements can be and often are reversed. This is the nature of human rights activism around the globe. In the case of the Separation Barrier, the Israeli High Court ruled that the route caused disproportionate harm to Palestinians and must be changed. The human rights community was instrumental in mapping the route of the barrier and documenting the harm it would cause. This served as the basis for the referral of the issue to the International Court of Justice, whose deliberations almost certainly influenced the Israeli Court. Weekly demonstrations in Palestinian villages against the Barrier also influenced the Court, leading to further modifications of the route. Israel still constructed most of the Barrier inside the West Bank. However, as a result of these modifications, some 375,000 people and 280,000 dunams (just over 69,000 acres) of West Bank land were “saved” from being encircled or isolated by the Barrier. As these two examples illustrate, virtually every achievement is partial. The situation improves, but violations continue. A policy is amended to better respect human rights, but remains imperfect. Achievements can be and often are reversed. This is the nature of human rights activism around the globe, an inherently Sisyphean endeavour. From the fourteen case studies, three tools emerged as highly significant in every achievement: documentation and analysis of the problem; litigation to Israel’s High Court of Justice; and mobilizing international policymakers to push for positive change. Three other tools had significantly weaker scores: mobilizing the Israeli public to champion Palestinian human rights (no surprise given the Israeli public hostility to this issue); direct engagement with Israeli policymakers (punitive house demolitions is one of the rare cases where the Knesset played a positive role); and leveraging Palestinian popular protest. Two tools were too new to be quantified but have the potential to be significant: video documentation and pursuing international accountability, given Palestine’s accession to the International Criminal Court. Several lessons emerged from this analysis. First, no single tool is going to work in isolation; we must combine domestic and international advocacy to be effective. This does not mean every organization has to pursue every strategy; in fact it is better if organizations develop their relative advantage. And human rights organizations have to understand their place within the larger system that influences human rights. Our documentation and analysis has galvanized humanitarian agencies, the press, private attorneys as well as political actors, who then amplify the human rights message. Invariably this is what proves successful. Israeli occupation is more entrenched than ever, with increasing violence and violations of rights. It can be hard to see our impact in such a reality. But as Emma Naughton and Kevin Kelpin argue, social change “happens incrementally and slowly, but it does happen. Activists and donors should celebrate the small wins along the way.” Indeed, recognizing and learning from these small wins strengthens our ability to bring about larger victories in the future.